Egyptian President Mohamed Morsi's decisions on Sunday to amend the Constitutional Declaration and revoke the June 18 addendum are unconstitutional, argue a host of legal experts who also said action must be taken against Morsi. On the last day of the presidential elections in June, the Supreme Council of the Armed Forces (SCAF) abruptly introduced an addendum to March 2011's Constitutional Declaration, which gave the military body authorities at the expenses of the president. Shortly after being elected, Morsi and the Muslim Brotherhood – the group he hails from – voiced disgruntlement over the constitutional addendum and called for full presidential authorities. For a while, protests were staged in Tahrir Square to sound that demand, but demonstrations faded out as pressure from the street on the SCAF died down. After a period of relative calm, however, Morsi has on Sunday implemented momentous reshuffles that saw Hussein Tantawi, the minister of defence and the general commander of the Armed Forces, and Sami Anan, the army’s chief of staff, retired from their military positions and made consultants to Morsi. Morsi took the oath of office before the Higher Constitutional Court (HCC) under the same very constitutional addendum he has now declared null and void, and thus the revocation of the annex contradicts with his pledge, opined judge Tahany El-Gebaly, current member of the HCC. She told Ahram Online: "Morsi has sworn that he will respect the constitution and the law, and since Egypt has a temporary constitution issued on 30th March [part of it was voted for through a referendum and the rest introduced by the military council] he should have abided by them." "A president does not have the power to abrogate a constitution, even a temporary one; Morsi should have remained committed to the Constitutional Declaration and to constitutional legitimacy." Indeed, other legal experts echoed similar sentiments. Essam El-Islamboli, a veteran cassation lawyer, stressed that: "Morsi does not have the authority to cancel the addendum to the Constitutional Declaration, because under that constitutional chart he took the oath as the new president. "This Constitutional Declaration and its addendum were among the specialties of those in power [SCAF] before the inauguration of Morsi. Only interim authorities that come to power after uprisings have the right to cancel a constitution." Previously presidential authorities were outlined in Article 25 and 56 of the 30 March Constitutional Declaration. Legislation, a parliamentary responsibility, was not one of the powers of the president. After the SCAF dissolved parliament's lower house, upon enforcing a verdict from the HCC declaring the People's Assembly unconstitutional, the military council assumed the power to legislate in their controversial June amendments. By cancelling the SCAF addendum and then authoring the 12 August changes, Morsi has assigned these additional "supra" powers to the president. They include the power to legislate and to issue public policy and the budget (according to sub-point 1 and 2 of Article 56). With the status of the parliament still uncertain, Morsi now has full power to author, approve and promulgate legislation, an authority not usually ascribed to the executive body. "After the 2011 Constitutional Declaration, the SCAF was granted what is called the revolutionary constitutional legitimacy and that is what enabled the body to make decisions during its interim tenure," Judge Mohamed Hamed El-Gamal explained to Ahram Online. "Through that legitimacy, the SCAF dissolved the People's Assembly and that is why it introduced the constitutional addendum to assume legislative authorities, and that addendum stipulates the SCAF's powers cannot be touched. "Only the SCAF is constitutional authorised to revoke the addendum because it is the body that has the revolutionary constitutional legitimacy; not the president, cabinet or parliament, if there is one. Thus, Morsi's decision is illegitimate, and also the following decisions that prompted reshuffles. "Morsi is a president who was elected under a certain constitutional system; he cannot just turn against it." When asked about the possible actions that would be taken against Morsi's decision, El-Gamal said: "It is really hard to speculate what the SCAF members would do but this is out of control now; the disputes between both sides are flagrant now and cannot be sorted out in courts anymore." El-Gebaly, for her part, said: "As a mere citizen, not an official, I think the HCC should step forward and take action if other legal gurus prove that Morsi’s new constitution is illegitimate as I see it." Newly appointed deputy defence minister General Mohamed El-Assar told Reuters that Morsi's decision to retire top army leaders was taken in consultation with Tantawi. From the perspective of Mohamed Fouad, a presidential legal consultant: "Morsi has only evoked his authorities as president and transferred the legislative powers from the SCAF to himself because he is the one in power now. "These legislative powers will be returned to the parliament after new parliamentary elections are held …These decisions are exactly like the ones the SCAF used to make while in power; they are backed by the power of the law until the People's Assembly is elected." if there is new constitution, then what is a HCC? Mrs El-gebaly can read what 30 march constitution declaration asserted to HCC. Not to speak public to reveal her bias to killers [old regime] is her constitutional duty. where was her constitutional power when mubarak killed thousands of citizens of out of right. assaulted and harassed hundreds of women's in torture cells and in jails, tested their 'private parts' for virginity against their will. Mrs judge was those actions constitutional? these moves should not be analyzed outside of other current events, like the treatment of opposition media, and the appointments of Ministers to departments where takeover of 'institutions' is vital. and don't forget, morsi told his triad of liars he was going to lie during his oath the next day. This argument is totally rubbish ! Indeed an interesting situation, but since the army has agreed it has given back its power to the head of state. There can be only one head of state and the transition period is over. Morsi did this for all next presidents of Egypt, not just for himself. It was a very wise decision and everybody should be happy with it. Al Dostour newspaper has been suspended, before that it was the Pharaohs channel and now this. 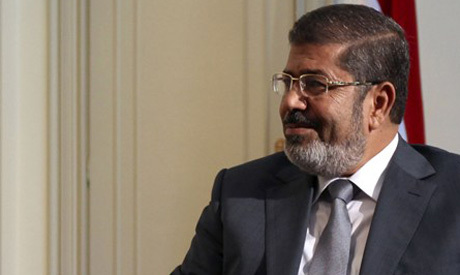 Any one who opposes the Morsi and the brotherHOOD will be considered a Kafir (blasphemous). Egyptians are losing their liberties everyday and soon these brotherHOODs from the dark ages are going to rule Egypt with the worse totalitarian politics ever, the religious dictatorship is here, if you oppose them you will be considered blasphemous opposing Allah himself. Have you read Al-doustour? Full of rubbish, lies and more lies and inciting unrest, too bias and demafation without basis. This has to be stopped. Freedom of specch has limit, do you think this paper will survive this long in other country? Hell no! have you ever read Al-Doustour? As a foreigner who lived in Egypt for two years (until last month), I am horrified to see how Egyptian judges can seriously declare that SCAF's addendum was legitimate while Morsi's is not. To say that any institution elected by the people (the original constituent power) has no legitimacy to revoke SCAF's addendum is not only shameful but also contradictory. Institutions elected by the popular vote to make the basic laws are free to change whatever they wish in the previous legal system. To believe anything different is to serve authoritarianism. No obsession involved. I was using the Hamas parentage as a marker, to indicate the extremism of the Brotherhood's actual politics. The point is, when SCAF gave itself legislative powers, it did not actually abuse those powers -- or, indeed, use them. But now we have military, executive, legislative and media power in the hands of people who have the most extreme politics. A very serious matter.